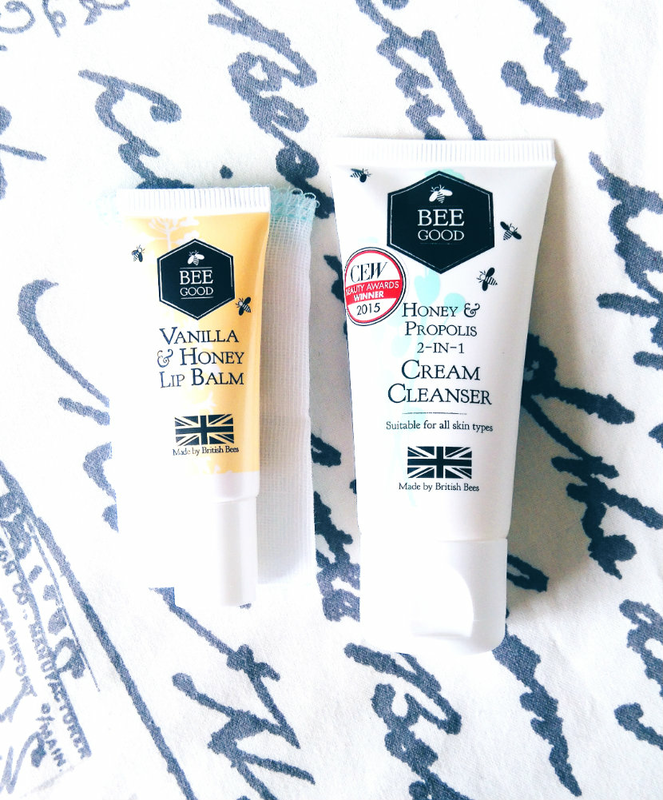 You may remember a time a while back when it felt like almost every blogger was featuring British skincare brand Bee Good. I read every review with interest (especially since they were pretty much all positive!) but never got round to trying any of their products. Until now. Before we start, here’s a little bit about the brand. Bee Good was founded in 2008 by Simon, a beekeeper, and his wife, Caroline. Caroline was interested in using the excess honey and beeswax to create skincare products and so the brand was born. I really love that they’ve found a use for the excess instead of simply throwing it away. I received the Award Winners* gift pack, £9.50, which contains a small 30ml tube of the much-hyped Honey & Propolis 2-in-1 Cream Cleanser and 10ml of the Vanilla & Honey Lip Balm. The gift pack comes with a teeny muslin cloth, which is so small that there’s no point it even being there; I may use it as a duster. But the cleanser itself is lovely. The creamy texture feels soft and nourishing on the skin, without being too heavy, while the eucalyptus scent reminds me strongly of Liz Earle’s Cleanse & Polish — something to bear in mind if you like/dislike that particular smell, although the honey in this does balance it out a bit. I would only ever use this as a morning and/or second cleanser, though, because it stings like nothing else when you use it to take your make-up off. This is never welcome, but it’s especially unwelcome when you have to put contact lenses in the next day. That said, the Honey & Propolis Cleanser hasn’t upset my skin or caused an acne flare-up, nor did I wake up with panda eyes the next day. I won’t be investing in the full-size version but I’d be happy to use it in the mornings for now. I’ll be upfront: I’m in love. I am not loyal to lip balms in the slightest and try to have as many on the go as possible (insert your own jokes here) but this is definitely one I can see myself buying again. Smooth and moisturising with a sweet scent, it glides on lips and has a long-lasting effect, instead of drying your skin out about half an hour or so. For some reason I was convinced this had white chocolate in, but no — it’s the sweetness of the vanilla and honey that does it. Some may find it quite sickly but I have to admit, I like it. It’s comforting in the same way your favourite dessert is after you’ve had a difficult day. Have you tried anything from Bee Good before? What did you think? Let me know in the comments!